1/ Mix the salt, pepper, garlic powder and paprika in a bowl. 2/ Coat the tenderloin in olive oil and generously sprinkle with the previously prepared spice blend. 3/ Program the application to the “Beef - Medium Rare” setting and insert the meat°it probe into the thickest part of the tenderloin. 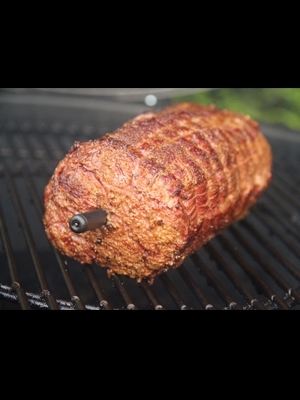 4/ In an oven or over indirect heat on a barbecue, roast the tenderloin until the probe sounds (200°F/54°C). 5/ While it cooks, prepare the tomato chutney. In a skillet, lightly brown the finely minced onion, cumin, coriander and pepper in olive oil for approximately 8 minutes over low heat. Add the tomatoes, vinegar and sugar. 6/ Let simmer about 25 minutes and season with salt and pepper. 7/ Once the alert sounds, remove the meat from the heat and program standing time for 10 minutes. Tent the beef tenderloin with aluminum foil.